As you probably already know, the fitness of the average American has been declining for quite some time. In fact it’s become so bad that the military is concerned about an epidemic of obesity among soldiers, sailors, and airmen. An average of 12 percent of all active duty personnel are currently obese. This is particularly worrisome, because traditionally the military was considered one of the fittest segments of the population. If they’re having a weight problem, you know it’s probably pretty bad across the country. Of course, this has been an issue for quite some time. The military has been lowering their physical standards for years, in the hopes that they can fill their recruit quotas. If you could look into the past, you would find that previous generations of Americans in their prime, could probably wipe the floor with the current crop. This isn’t just some anecdote you might hear from your grandpa reminiscing about the good ole days. There’s proof that our fitness levels have severely declined in less than a century, and you need not look any further than the World War Two fitness test. During the late 90’s a doctor by the name of Ed Thomas worked for the Army Physical Fitness School, where he stumbled upon some of the older manuals from the World War Two era. He decided to test modern soldiers under the previous standard, only to find that even the fittest units struggled to pass. That was 15 years ago. You can imagine how bad it is now. I’ve taken the test myself, and found it quite daunting. I’ve always assumed that I had an average fitness level. Throughout my school years I always found that there were just as many people who scored above me, as those who scored below me on fitness tests. Despite this, I couldn’t pass all of the exercises. And that’s the most telling aspect of the World War Two test. It reveals a lot about the fitness of the average person in those days. 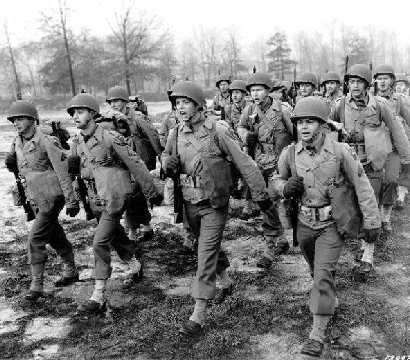 This was time when nearly every male served in the military. An average guy in the 1940’s could be plucked off the streets, and could be expected to either pass this test, or could be trained to pass it within a few months. That’s certainly not the case anymore. Jeez grandpa, quit making me look bad. While it seems the Army has a higher standard for pushups and situps, the real killer here is the number of exercises you have perform. Despite the Marine and Army fitness tests having fewer exercises, they both give you the same 2 hour block of time as the World War Two test. The running is different as well. Modern armies seem to emphasize long distance running, whereas the previous test was more about sprinting (arguably a more useful skill). So are you ready to take the World War Two fitness challenge? If you are, you’d better brace yourself for months of practice. Even if you’re already in decent shape like I thought I was, it’s going to take some long term dedication. You should probably start now if you want a chance at beating your grandpa’s pushup score before you meet up for the holidays. Here’s a few tips to improve your pullups, pushups, jump squats, sprinting, and situps. 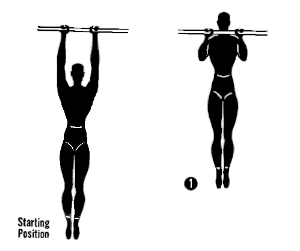 The most difficult aspect of pull-ups is your body weight. It’s an anaerobic exercise just like weight lifting, but with the added challenge of not being able to adjust the weight. If you’re trying to push, pull, or lift a weight, and you’re not strong enough, you can just take a few plates off the bar. Obviously you can’t do that with your body weight. For this reason, most people struggle with this exercise more than any other. If you’re struggling to do a single pull-up, find a partner to lessen the load by holding your legs. What makes pull-ups so challenging for the beginner, is not being able to get past that first rep. If you can’t go through the whole range of motion, it’s going to take a very long time. But, with a partner holding some of your weight, you’ll be able to go through the full motion and improve your strength. You’ll find that eventually you’ll be able to do a few pull-ups without any help. Once you can do more than 5 on your own, it’s time to start adding weight. I typically throw a few weights into a backpack and try to do a couple short sets every week, though a weight vest will probably be easier and safer. Once I can do a few pull-ups with the weight, I find that I can do many more without it. Just keep adding weight over time, and going back and forth between using weight and going without them. Rinse and repeat until you reach your goal. Starting Position. 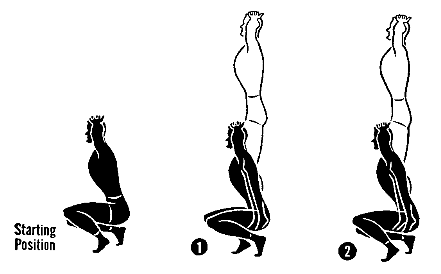 Squatting on right heel with fingers laced on top of head, palms down. The feet are 4 to 6 inches apart with the heel of the left foot on a line with the toes of the right foot. Movement. Spring upward until both knees are straight and both feet clear the ground. Jump just enough to permit straightening the knees without touching the ground. Do not jump any higher than necessary to accomplish this purpose. Keep the upper body erect. While off the ground, reverse the position of the feet bringing the right foot in front. Then drop to a squat on the left heel. Keep the knees pointing forward. Spring up again and continue for as many repetitions as possible. Unlike the pull-ups, adding weight here could be quite dangerous. You run the risk of rolling your ankle, even without the weight. For the most part, it looks like something you can only improve by practicing, but if you’re having trouble with it, the best thing to do is just ordinary squats. There’s no jumping or footwork involved. Just keep your back straight through the full range of motion, and squat down until the tops of your thighs are parallel with the floor. Once you can do a lot of them without getting too exhausted, give the Jump Squats another try. Improving this is similar to improving pull-ups. If you can’t do more than a handful of them, you should lessen the load by doing “girl” pushups (I’m really surprised the PC crowd hasn’t thought of a new name for that one). Of course you wont be working your abs very much. To cover that ground separately, you should try doing planks. This involves getting into the pushup position with your forearms resting flat on the ground, and holding that position for as long as you can. And finally, to improve your leg muscles you should be doing squats, though I suspect you’ve already got that one covered. It’s difficult to make a suggestion for situps, for the simple fact that they may not be good for you. Nowadays, many doctors and physical therapists believe that situps may be doing damage to the discs in your spine. If you think it may cause problems for you, I would suggest crunches instead. This is what the Marine Corps does in their fitness test, and to reach a perfect score, you have to do 100 crunches in two minutes. Since crunches have a shorter range of motion, you’ll be able to do more of them, so 100 reps sounds like a good substitute for the 79 situps in the World War Two test. As for improving your score, don’t sweat it on this one. You’ll be using your abs in the previous exercises, especially pushups and pull ups. Doing those will improve your crunches, and vice versa. This one is a doozy. I consider it the most difficult exercise of the bunch, because this isn’t just a 300 yard run. It’s actually a 60 yard course with several lanes. You have to run from one end to the other five times. You can abbreviate the size of the course by giving it a single lane with 2 markers. What’s important is that you run around the markers. Doing this forces you to slow way down, and speed right back up every time you reach a marker. I thought I was a decent runner until I attempted this exercise. I ran so fast I thought I was going to hurl. I still failed. All from an exercise that takes less than a minute to complete. To improve your time, I would suggest doing sprints on an incline. I happen to have a very steep hill near my house that I can sprint up from time to time, and I’ve seen my speed improve. Basically, sprinting uphill improves your running in the same way that adding weight can improve your pull-ups. Like any anaerobic exercise, you can’t better your score without adding weight. Sprinting uphill does this in several ways. For starters, the incline forces your body into the perfect form for running. You’re leaning slightly forward and landing on the balls of your feet, rather than your heels. If you do this once or twice a week, you’ll find that your running time on flat ground will improve. In fact, uphill sprints will not only improve your sprints, but long distance running as well. Maybe then you’ll finally be able to keep up with your grandpa and his WW2 buddies.